A couple of days ago, PikPok games released Into the Dead on Android, as a Zombie survival game that I can’t seem to stop playing. 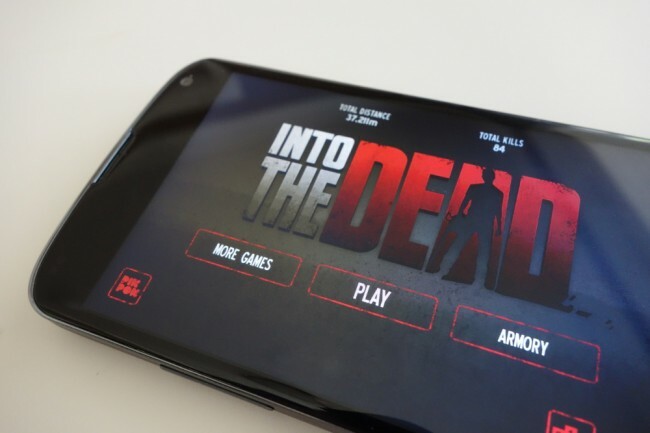 It’s a runner-style game, similar to what you get with Temple Run in that there are objectives, distance goals, and a coin system, but for fans of the zombie genre or shows like The Walking Dead, you’ll probably love this. It’s bloody, has a great soundtrack, and is in a way, somewhat creepy. The objective is to survive in a world filled with zombies for as long as you can. You start off in the middle of field just after a helicopter crash only to realize there are hundreds of zombies on the verge of gobbling your brains. You turn and run away, dodge between outreaching zombie arms, jump fences, find safe passages through corn fields and forests, pick up guns and other weapons along the way, all while trying to create the highest score possible. As you stretch your top distance, amass a coin collection, and conquer perks, you’ll unlock new weapons (like a chainsaw or shotgun), new zombie packs, and other bonuses. It’s awesome. Oh, Into the Dead is also 100% free. There are ads in between games as you transition menus, but never while you are in the middle of a session. It definitely operates under the freemium model as well, tempting you with coin purchases to unlock perks and weapons even faster.